Usage of Tea Tree Oil: Antiseptic properties against; Acne; Insect’s bites, boils and minor wounds; Athlete’s foot; Dandruff; Fungal nail infection; Genital herpes;MRSA; Plaque/ gingivitis; Vaginal infections. 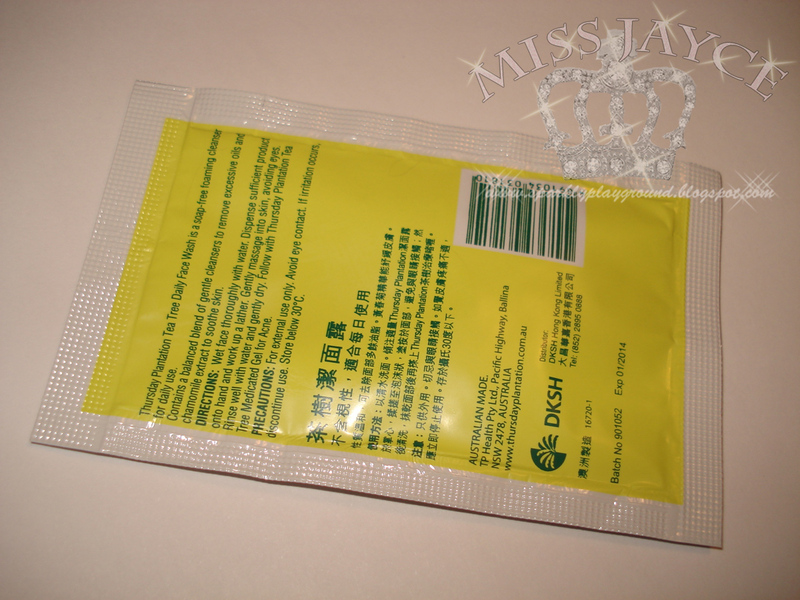 The product is in gel form, clear and smells just like tree tea. I guess I can describe it as "herb". I like this smell a lot because I love natural products. 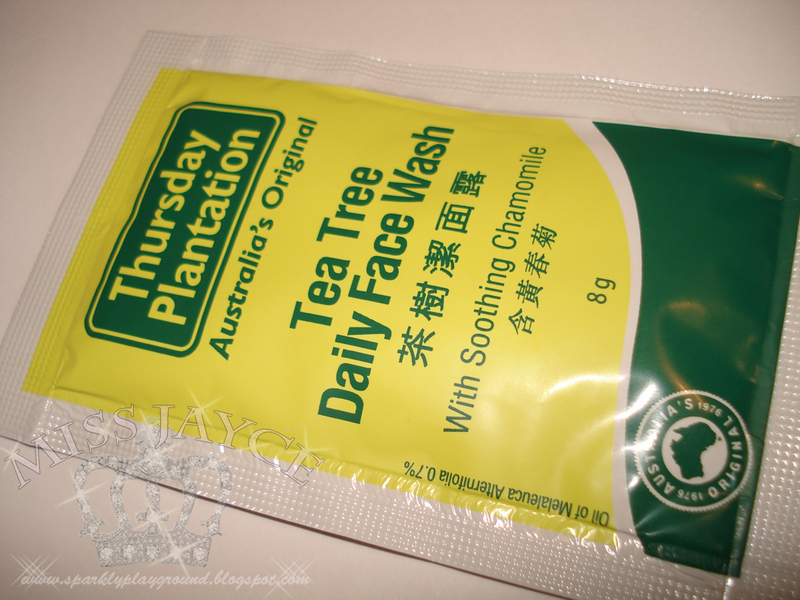 Thursday Plantation Tea Tree Daily Face Wash is a soap-free foaming cleanser for daily use. For external use only. Wet face and gently massage into skin, avoiding eyes. Rinse well and pat dry. May be used daily. Use only as directed. Discontinue use if sensitivity occurs. Do not us internally: this product has been designed for external skin application. Do not use near eyes: avoid contact with eyes. Seek medical attention if contact occurs. Do not use with other acne treatments due to possible unknown interactions. In Pacific Mall Toronto, $17-$22CDN. I believe it's because my midterms are coming up and my abnormal menstrual cycle, i was experiencing what I call, Stress Pimples and White heads. I have Dry/Combination and highly sensitive skin type so I was quite skeptical when trying this product. When I was on MUA, most people who uses this product have acne prone/oily skin, so I became worried about over drying or flaking or other irritations. Since this is a natural product, I gave it a try anyway.With the samples I received (10 samples x 8g = 80g; almost 1/3 of the actual size) It lasted me about 2 and 1/2 weeks. I love the smell of this product right when I opened the package. I do think it can be a personal preference since i have a soft spot of herbal scents or anything smelling natural. It gave me a very soothing and calm feeling after cleansing my face. I love using this after I remove my make up after a whole day of work/school. It's very refreshing and no irritations at all. Make sure you don't get it in your eyes though, it's not the nicest feeling. I did experience some tightness but with some hydration toners and face moisturizers, the tightness is not a huge problem if you're using it for a few weeks (just to target some trouble areas). However, if my skin is behaving, I will use my regular face wash because I don't want this item to rip off too much of my natural face oils. In terms of the results of my stress pimples and whiteheads, I noticed that it has cleared up. Especially around my nose and T-zone area. Even my blackheads seems to be disappearing. I think it does a superb job of cleaning and although it's quite dry for me. I think this is an excellent product for oily/combination to acne prone skin. I took off one point because for a dry/combination skin type like myself, I find that it will be over drying in the long term. Fits with description perfectly since it was designed for Acne prone skin. Very affordable and comes in a great size!